Hours before he was arrested in the shooting deaths of two Kissimmee police officers Friday night, Everett Glenn Miller posted photos online of a home and the tall grass surrounding it. Less than six hours later Miller, 45, was under arrest in a Kissimmee bar, accused of shooting two police officers on neighborhood patrol. Both officers died of their injuries. 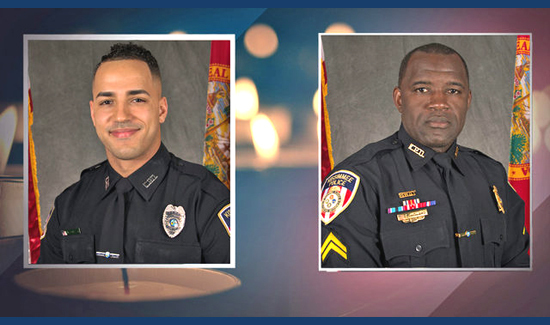 Miller was with two other people near Palmway and Cypress streets when Kissimmee Officer Matthew Baxter (above, left) approached them to investigate a report of suspicious people. Police have released few details about what happened next. But a “scuffle” broke out, said Kissimmee Police Chief Jeff O’Dell; it ended with Baxter and Sgt. Richard “Sam” Howard (above, right), who came to help him, shot. Osceola County sheriff’s detectives found Miller about two hours later at Roscoe’s Bar on Orange Blossom Trail. He was carrying two guns: a 9mm and .22 revolver, police said. Miller is in the Osceola County Jail facing charges of first-degree murder, resisting arrest without violence and illegally carrying a concealed weapon. Attempts to reach some of his family members and others who know him were not successful Saturday. The other two people were questioned but not arrested, police said. Miller enlisted in the U.S. Marine Corps in 1989, Department of Defense records show. He left active duty on July 27, 2010. O’Dell said Osceola deputies recently took the veteran into custody under Florida’s Baker Act, which is used to involuntarily commit people going through mental health crises. Information on Baker Act commitments is not public record. Miller had no criminal record in Florida, Florida Department of Law Enforcement records show, and three minor traffic tickets in Osceola County. He apparently spent the early hours of Friday on Facebook, making nearly 30 posts. About 20 of them were published between 1 a.m. and 6 a.m.